The concept of spontaneous- or constitutive-activity has become widely accepted and verified for numerous G protein-coupled receptors and this ligand-independent activity is also acknowledged to play a role in some pathologies. Constitutive activity has been reported for the mu opioid receptor. In some cases the increase in receptor basal activity was induced by chronic morphine administration suggesting that constitutive activity may contribute to the development of drug tolerance and dependence. Constitutively active mutants represent excellent tools for gathering information about the mechanisms of receptor activation and the possible physiological relevance of spontaneous receptor activity. The high basal level of activity of these mutants also allows for easier identification of inverse agonists, defined as ligands able to suppress spontaneous receptor activity, and leads to a better comprehension of their modulatory effects as well as possible in vivo use. Cysteines 348 and 353 of the human mu opioid receptor (hMOR) were mutated into alanines and Ala348,353 hMOR was stably expressed in HEK 293 cells. [35S] GTPγS binding experiments revealed that Ala348,353 hMOR basal activity was significantly higher when compared to hMOR, suggesting that the mutant receptor is constitutively active. [35S] GTPγS binding was decreased by cyprodime or CTOP indicating that both ligands have inverse agonist properties. All tested agonists exhibited binding affinities higher for Ala348,353 hMOR than for hMOR, with the exception of endogenous opioid peptides. Antagonist affinity remained virtually unchanged except for CTOP and cyprodime that bound the double mutant with higher affinities. The agonists DAMGO and morphine showed enhanced potency for the Ala348,353 hMOR receptor in [35S] GTPγS experiments. Finally, pretreatment with the antagonists naloxone, cyprodime or CTOP significantly increased Ala348,353 hMOR expression. Taken together our data indicate that the double C348/353A mutation results in a constitutively active conformation of hMOR that is still activated by agonists. This is the first report of a stable CAM of hMOR with the potential to screen for inverse agonists. The opioid receptors and endogenous opioid peptides form a neuromodulatory system that plays a major role in the control of nociceptive pathways. The opioid system also modulates affective behavior, neuroendocrine physiology, and controls autonomic functions such as respiration, blood pressure, thermoregulation and gastrointestinal motility. The receptors are targets for exogenous narcotic opiate alkaloids that constitute a major class of drugs of abuse . Genes coding for δ, κ and μ opioid receptor types have been identified and isolated from different vertebrates. Analysis of their sequences shows that the receptors belong to the G protein-coupled receptor (GPCR) superfamily. The three opioid receptor types exhibit different pharmacological profiles but all three mediate their cellular effects by first activating heterotrimeric G-proteins of the inhibitory type that negatively couple to adenylyl cyclase. The delta opioid receptor was the first GPCR described as able to modulate second messengers in the absence of an agonist . To date the concept of spontaneous- or constitutive-activity has become widely accepted and verified for numerous GPCRs [2–5], and this ligand-independent activity is also suggested to play a role in some pathologies . For opioid receptors, constitutive activity has now been reported not only for the delta [7–11] but also for the kappa  and mu opioid receptors. In this latter case, constitutive activity arose from spontaneous coupling to endogenous G proteins [13, 14] or was induced by chronic morphine administration [15, 16]. Some ligands like naloxone and naltrexone were shown to act as antagonists in untreated cells and to display inverse agonist properties following morphine pretreatment [14–16]. Detection of enhanced basal activity for mu opioid receptor densities as low as 150 fmol/mg protein suggested that this activity is of physiological relevance and may be involved in the mechanisms underlying opioid tolerance . Receptor mutagenesis has been widely used to probe receptor activation mechanisms. Interestingly, some mutations appeared to enhance basal activities of GPCRs. Such mutations are believed to mimic agonist activity and favor the active state of the receptor, thus facilitating productive interaction with intracellular G proteins. These mutant receptors are currently called Constitutively Active Mutants (CAM) and exhibit several remarkable characteristics [17–22]: (1) enhanced basal signaling activity, (2) increased affinity for agonists, (3) enhanced agonist potency and (4) increased level of expression upon cell treatment with antagonists or inverse agonists. Several CAMs have been described for the delta opioid receptor [23–25]. Recently two mutants were also reported for the mu opioid receptor. However both D164Q [26, 27] and T279K  mutations resulted in highly unstable mu receptors that required addition of naloxone for stabilization and detection of ligand binding. In this work we characterized a mutant of the human mu opioid receptor in which cysteine residues 348 and 353 were replaced by alanines. The resulting protein was stably expressed in HEK 293 cells at a pmol/mg membrane protein level and exhibited all the characteristics of a constitutively active mutant. Its potential use to screen for inverse agonists was also established. We replaced cysteines 348 and 353 with alanine residues in the human mu opioid receptor (hMOR). Alanine residues were preferred over serines to avoid introduction of additional potential phosphorylation sites in the C-terminal part of the receptor. Wild-type hMOR and the Ala348,353 hMOR mutant were stably expressed in HEK 293 cells and compared. Scatchard analysis indicated that both hMOR and Ala348,353 hMOR displayed similar Kd values for the antagonist diprenorphine (Table 1) and that maximal expression levels were 1.50 ± 0.20 pmol/mg membrane protein for Ala348,353 hMOR and 4.13 ± 0.26 pmol/ mg membrane protein for the wild-type hMOR. Addition of a ligand in the culture medium was not required to reach and maintain the high Ala348,353 hMOR expression level nor did this level vary significantly with time for up to several months of culture, corresponding to at least 25 passages. Binding affinities for hMOR and Ala348,353 hMOR stably expressed in HEK 293 cells. Competition experiments were as described in the Experimental Procedures. Data are given as the mean ± S.E.M. from at least 3 independent experiments performed in triplicate. Statistical analysis was performed using Student's t test: the asterisks (*p < 0.05) refer to Ki values significantly different from corresponding Ki values for hMOR. Data collected on several clones expressing hMOR or Ala348,353 hMOR demonstrated that the double mutant exhibited higher level of spontaneous [35S] GTPγS incorporation when compared to hMOR (25 ± 2 fmol/mg and 41 ± 2.5 fmol/mg respectively, Student's t test p < 0.001) (Table 2). Moreover, since the expression level of Ala348,353 hMOR was approximately three times lower than the wild-type receptor, these results strongly suggest that the mutant is a CAM receptor. We further investigated [35S] GTPγS binding to probe the associated G proteins. Coupling of opioid receptors is known to proceed through inhibitory Gα proteins either pertussis toxin (PTX) sensitive (Gi/o) or insensitive (Gz), the latter type being absent from HEK 293 cells . PTX treatment abolishes interaction between the receptor and inhibitory Gi/oα proteins by ADP ribosylation of a C-terminal cysteine residue on the Gα protein. Following PTX treatment, the [35S] GTPγS basal level of incorporation for hMOR was reduced to the level observed in untransfected HEK 293 cells (Figure 1A), denoting some spontaneous coupling of the wild-type receptor to endogenous Gi/o α proteins under our experimental conditions. The high [35S] GTPγS basal level of activity observed for the double mutant was also reduced by PTX treatment though not to the level observed in untransfected HEK 293 cells, suggesting that spontaneous coupling of the mutant receptor might also be mediated via PTX-insensitive Gα proteins (Figure 1A) (see discussion). DAMGO-stimulated [35S] GTPγS incorporation was completely abolished by PTX treatment for both the wild type and the double mutant as expected for receptors coupled to Gi/o α proteins (Figure 1B). 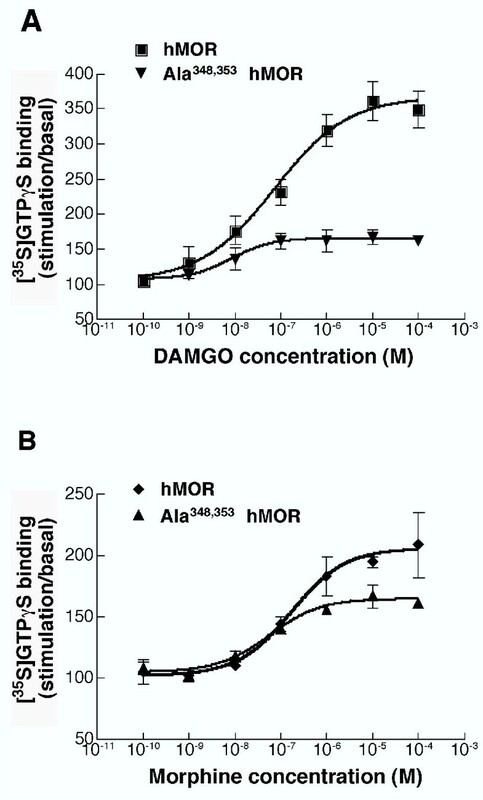 Comparison of hMOR and Ala 348,353 hMOR [ 35 S] GTPγS binding with or without PTX treatment. 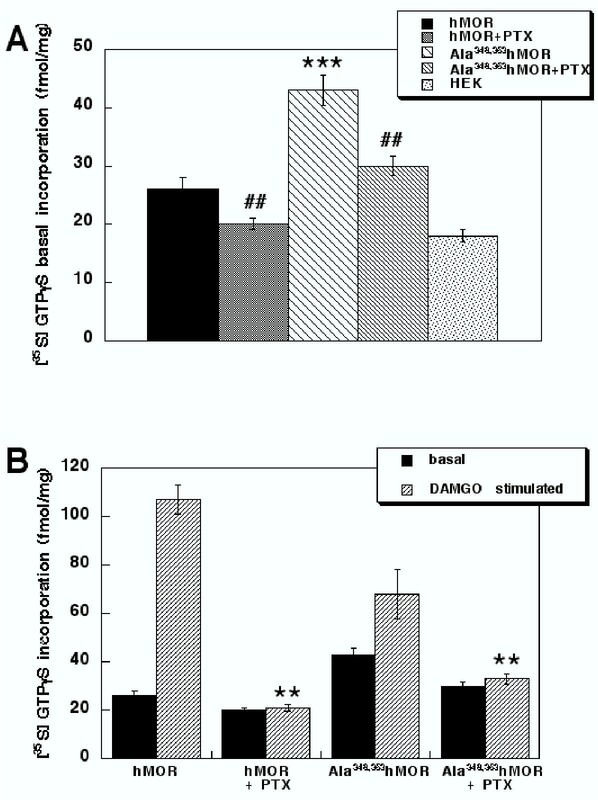 Basal (panel A) and DAMGO-induced (panel B) [35S] GTPγS incorporation were measured as described in the Experimental Procedures. Membranes were prepared from HEK 293 cells stably expressing hMOR or Ala348,353 hMOR. Cells were treated with 100 ng/mL PTX for 20 h where indicated. DAMGO was added at a concentration of 10 μM. Data are given as the mean ± S.E.M. from at least 3 independent experiments performed in triplicate. Statistical analysis was performed using Student's t test to evaluate the effects of mutation (***, p < 0.001) or PTX-treatment (##, p < 0.01) on basal [35S] GTPγS incorporation (panel A) and of the effect of PTX-treatment (**, p < 0.01) on DAMGO-induced [35S] GTPγS incorporation (panel B). CAM receptors are generally characterized by increased agonist binding affinity while antagonist binding affinity remains unaltered [17, 18, 20, 21]. Consistent with this, binding affinities of most agonists tested were increased for Ala348,353 hMOR when compared to hMOR. Interestingly, morphine and dermorphin affinities were increased approximately 20-fold while we found no significant change in affinities for the three endogenous peptides dynorphin A, met-enkephalin and β-endorphin (Table 1). On the other hand, binding affinities of several ligands previously described as antagonists remained virtually unchanged while we observed at least a 10-fold increase in affinity for the antagonists CTOP and cyprodinie (Table 1). Interpretation for this latter observation remains uncertain. Therefore modifications of ligand binding, classically described for CAM receptors, were verified for most, but not all opioid compounds. We measured [35S] GTPγS incorporation and determined the EC50 values for DAMGO and morphine as prototypic full and partial agonists, respectively (Table 2). EC50 values for Ala348,353 hMOR were decreased almost 10-fold for DAMGO (9.1 ± 2.4 nM versus 81 ± 2 nM) and 3-fold for morphine (60 ± 2 nM versus 176 ± 2 nM). These data demonstrate that agonist potency is increased, as observed for other CAM GPCRs [17, 20]. DAMGO-induced maximal [35S] GTPγS incorporation was considerably lower at Ala348,353 hMOR than the wild-type receptor while morphine activated Ala348,353 hMOR and hMOR to a similar extent (Table 2). When expressed as a percentage of stimulation above basal levels (Figure 2), the maximal efficacy of both ligands was reduced when compared to hMOR (respectively 164 ± 6% versus 366 ± 23% for DAMGO and 164 ± 5% versus 205 ± 9% for morphine) due to the higher basal activity level of the double mutant. Moreover, the lower level of expression of the mutant receptor could also contribute to this observation since it directly affects the extent of [35S] GTPγS incorporation . Taken together these results indicate that Ala348,353 hMOR is activated by agonists and that the extent of activation seems to be ligand dependent. DAMGO and morphine-stimulated [ 35 S] GTPγS binding at hMOR and Ala 348,353 hMOR. Increasing concentrations of DAMGO and morphine (10-10 to 10-4 M) were used to stimulate [35S] GTPγS binding. Panel A: DAMGO at hMOR (■) or at Ala348,353 hMOR (▼). Panel B: morphine at hMOR (◆) or Ala348,353 hMOR (▲). Data are given as the mean ± S.E.M. from at least 3 independent experiments performed in triplicate. Elevated basal activity of the receptors allows compounds to be tested for intrinsic negative activity, also called inverse agonism [5, 6, 30]. In order to identify ligands with inverse agonist properties, several antagonists were tested for their ability to decrease the basal level of [35S] GTPγS incorporation on the Ala348,353 mutant. Under our experimental conditions, all the tested compounds had statistically significant (Student's t test, p < 0.05) partial agonist activity on hMOR with the exception of naloxone and naltrexone (Figure 3A). Partial agonist activity has been observed for several opioid ligands originally described as antagonists such as cyprodime , CTAP , TIPP and Tic-deltorphine (Kieffer B.L. unpublished) as well as for 5HT4 ligands . In contrast, this partial agonist activity was not observed with Ala348,353 hMOR. Moreover cyprodime and CTOP significantly reduced the level of basal activity of Ala348,353 hMOR (89 ± 3% and 77 ± 5% of control respectively, Student's t test p < 0.01). The EC50 values were 93 ± 3 nM and 64 ± 3 nM for CTOP and cyprodime respectively (data not shown). These data suggest that both ligands possess intrinsic inverse agonist activity that is revealed at the CAM receptor (Figure 3B). Effect of antagonists on the incorporation of [ 35 S] GTPγS binding in membranes expressing hMOR and Ala 348,353 hMOR. [35S] GTPγS incorporation was measured as described in the Experimental Procedures. Panel A: membranes prepared from HEK 293 cells stably expressing hMOR. Panel B: membranes prepared from HEK 293 cells stably expressing Ala348,353 hMOR. All ligands were used at a concentration of 10 μM. Incorporation is expressed as percent variation over [35S] GTPγS binding in the absence of agonist. Data are given as the mean ± S.E.M. from 3 (except naloxone, CTOP and cyprodime where n = 5) independent experiments performed in triplicate. Statistical analysis was performed using Student's t test, *p < 0.05, **p < 0.01 compared to basal [35S] GTPγS. Addition of inverse agonists or antagonists to the cell culture medium was reported to increase the level of expression of CAM GPCRs by stabilizing their conformation [19, 20, 27]. 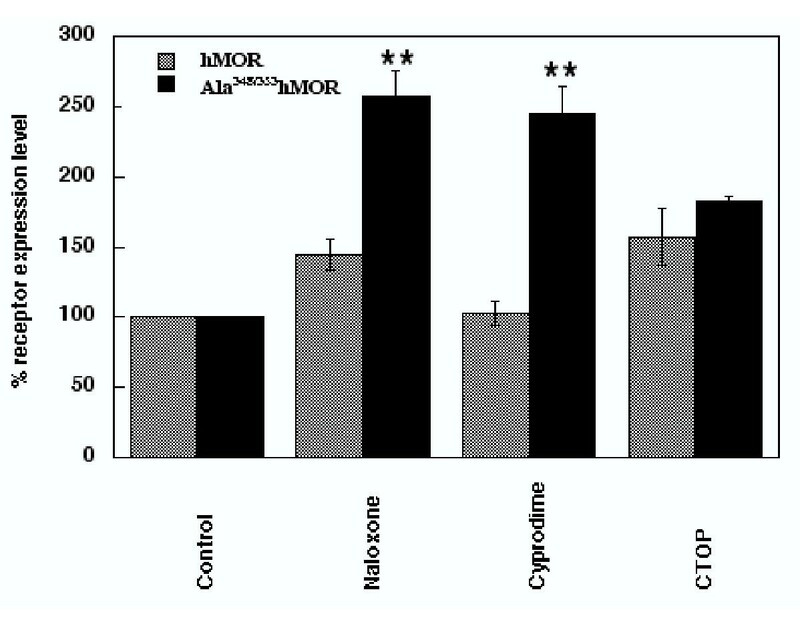 We therefore examined the effect of naloxone, CTOP and cyprodime on the levels of expression of hMOR and Ala348,353 hMOR. Expression levels measured on intact cells using [3H] diprenorphine were 243 000 ± 28 000 receptors/cell for Ala348,353 hMOR and 546 000 ± 103 000 receptors/cell for hMOR prior treatment. Naloxone and CTOP slightly increased hMOR expression levels (145 ± 11% and 157 ± 20% respectively) while cyprodime had no effect (103 ± 9%). In contrast Ala348,353 hMOR expression level was enhanced more than 2-fold in the presence of alkaloid antagonists (257 ± 19% with naloxone and 245 ± 20% with cyprodime, see Figure 4). Importantly Kd values for [3H] diprenorphine were not significantly altered by the various treatments (data not shown). Therefore, although basal expression of the mutant receptor is high, opioid antagonists increased the number of receptors as previously observed for other CAM GPCRs [19, 20, 27]. On the other hand, CTOP treatment increased both mutant (182 ± 4%) and wild type receptor (157 ± 20%) expression levels but failed to induce a significantly higher expression level for Ala348,353 hMOR as compared to the wild type receptor (Figure 4, see discussion). 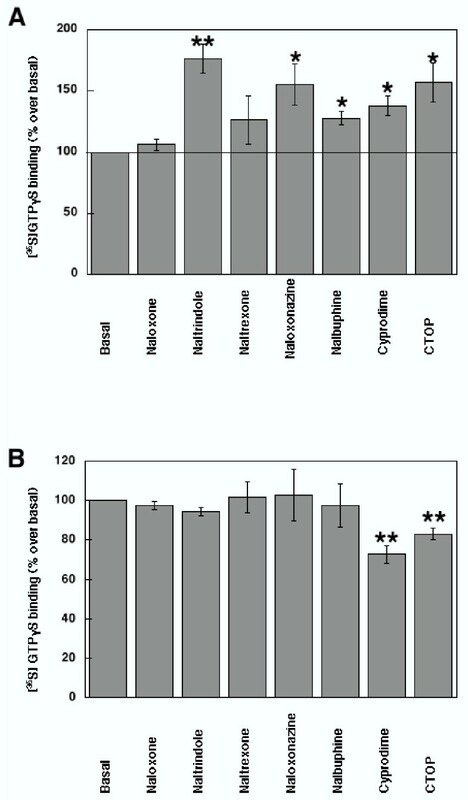 Receptor up-regulation by naloxone and cyprodime was detectable using intact cells treated for 48 hours and was also observed on membranes prepared from these cells (data not shown). Finally, because chronic morphine treatment was reported to increase basal activity of mu receptors in HEK 293  and GH3  cells, we treated our HEK 293 cells stably expressing hMOR or Ala348,353 hMOR with 10 μM morphine for 48 h. Under our experimental conditions, morphine pretreatment did not modify the basal level of [35S] GTPγS incorporated in hMOR or Ala348,353 hMOR. Moreover, we could not detect any increase of the maximal inverse agonist efficacy of CTOP and cyprodime following chronic morphine treatment of cells expressing either hMOR or Ala348,353 hMOR (data not shown). A possible explanation for this discrepancy could be a combination of factors such as cell type (HEK 293 cells versus GH3 cells), duration of morphine exposure (48 h versus 16 h in HEK 293 cells) and a lack of sensitivity of the detection method ([35S] GTPγS performed on crude membrane preparation without prior G protein isolation). Nevertheless, in agreement with previous reports, we observed a significant reduction of [35S] GTPγS incorporation following DAMGO stimulation for both hMOR (339 ± 16% versus 425 ± 26%, Student's t test p < 0.05) and Ala348,353 hMOR (120 ± 5% versus 153 ± 13%, Student's t test p < 0.05, data not shown) presumably reflecting receptor desensitization [16, 33]. In this paper, we describe a mutant of the human mu opioid receptor in which cysteine residues 348 and 353 have been replaced by alanines and we demonstrate that this mutant receptor is constitutively active, based on characteristic properties previously described for other CAM GPCRs. The most decisive criterion used to define a CAM receptor is enhanced basal activity. Ala348,353 hMOR exhibited basal [35S] GTPγS incorporation at least 1.5 times higher than wild-type hMOR under conditions where the mutant receptor was expressed at levels almost three times lower than the wild-type receptor. This strongly indicates that the Ala348,353 mutant spontaneously activates G proteins more efficiently than the wild-type receptor, and is further supported by the PTX sensitivity of this activity. Noticeably, for the Ala348,353 hMOR mutant, PTX treatment did not entirely reduce basal [35S] GTPγS incorporation to the level observed in non-transfected cells. One explanation could be that the mutant receptor is partially coupled to the inhibitory PTX-insensitive Gzα protein, as previously shown for mu receptors . Gzα subunits, however, appear to be absent in HEK 293 cells . Alternatively, one may speculate that the constitutive conformation of the mutant receptor may exhibit broader G protein selectivity allowing it to interact with Gα subunits for which coupling remains to be established. This could be of importance if chronic administration of drugs does indeed increase basal activity of the mu receptor [16, 33]. A residual [35S] GTPγS incorporation following PTX treatment could also be observed for the CAM T279K mu receptor . CAMs generally display enhanced agonist binding affinity, supposedly because a large fraction of the receptors are in a G protein-precoupled active state [20, 21]. Ala348,353 hMOR satisfied this criterion for most of the ligands tested. One notable exception was the modest changes in affinity showed by the endogenous opioid peptides compared to alkaloids or synthetic peptides. Dynorphin A showed only a tendency to an increase in binding affinity for Ala348,353 hMOR, while β-endorphin and met-enkephalin affinities remained unchanged. Interestingly, in another set of experiments, we forced receptor interaction with Giα proteins by fusing hMOR to Gi1α or Gi2α. As expected, binding affinities were increased for most agonists. However, β-endorphin and met-enkephalin affinities remained unchanged while dynorphin A affinity increased for the Gi2α-hMOR fusion only . Endogenous opioid peptides, therefore, could be less sensitive to the coupling status of the receptor compared to other exogenous or synthetic opioids. An implication of this observation is that the putative modifications of mu opioid receptor coupling following chronic morphine suggested by some authors [16, 33], may be of little consequence to endogenous opioid binding. Because of its high stable expression and CAM properties, Ala348,353 hMOR represents a unique tool for identification of compounds with inverse agonist properties. Our analysis of a number of mu receptor antagonists revealed, for the first time, negative functional activity for CTOP and cyprodime (see Figure 3B). Previous studies suggested that the irreversible antagonist β-CNA could inhibit the spontaneous activity of the wild-type mu opioid receptor . Also inverse agonist properties were reported for β-CNA as well as naloxone and naltrexone following chronic exposure to opioid agonists [14, 16]. Our data highlight two novel antagonists as mu opioid inverse agonists, and more will likely be discovered in the future. Upregulation of hMOR and Ala 348,353 hMOR expression upon ligand pretreatment of the cells. Saturation experiments using [3H]diprenorphine on intact HEK 293 cells stably expressing hMOR (checked bars) or Ala348,353 hMOR (black bars) following cell treatment with naloxone, cyprodime or CTOP 1 mM for 48 h as described in the Experimental Procedures. Data are given as the mean ± S.E.M. from at least 4 independent experiments. Statistical analysis was performed using Student's t test to compare upregulation at wild-type and mutant receptors, ** p < 0.01 compared to hMOR. Both DAMGO and morphine exhibited enhanced potency for Ala348,353 hMOR as expected for agonists interacting with a CAM. Enhanced potency to stimulate [35S] GTPγS binding can be correlated to the higher affinity observed for both agonists towards the Ala348,353 mutant receptor. Higher potency for agonists has also been described for CAMs of α1a-, α1b-[17, 20] as well as α2A-adrenergic  or β2-adrenergic receptors  and, more recently, for a CAM of the 5-HT4(a) receptor . Interestingly, all agonists tested increased ERK2 (p44) phosphorylation upon binding to Ala348,353 hMOR to levels higher than the wild type receptor, suggesting that the double Ala 348, 353 Cys mutation alters both Gα- and Gβγ-dependent signaling pathways (data not shown). Enhancement of expression levels following receptor exposure to a ligand is another typical feature of CAM GPCRs. Accordingly, Ala348,353 hMOR was significantly upregulated upon naloxone or cyprodime treatment. Interestingly, however, basal expression of the Ala348,353 hMOR receptor was relatively high and easily detectable in the absence of any ligand in the culture medium. Structural instability seems to be a frequent characteristic of CAMs, but this was not obvious in our case. Two CAMs of the mu opioid receptor were reported previously, with D164Q [26, 27] and T279K  mutations located in the transmembrane domains III and VI, respectively. Both mutants are highly unstable and require the presence of the antagonist naloxone in the cell culture medium for stabilization and pharmacological detection [27, 28]. One explanation for the relative stability of Ala348,353 hMOR may lie in the C-terminal location of the mutations downstream from helix VIII that is postulated on the basis of alignment with the rhodopsin three-dimensional structure . The mutated cysteines are not likely to be directly involved in the formation of the ligand binding pocket or critical in maintaining the three-dimensional architecture of the helical protein core. Ala348,353 hMOR expression was nevertheless upregulated upon cell treatment with naloxone, cyprodime or CTOP. According to the extended ternary complex model, CAMs are expected to favor the partially activated receptor state (R*) that is very often unfavorable in terms of energy and results in some structural instability [19, 37]. Antagonists as well as inverse agonists on the other hand bind preferentially to the inactive R state of the receptor and stabilize it. Therefore the increased number of double mutant receptors observed following naloxone, cyprodime or CTOP treatment may reflect the shift of the equilibrium towards the R form resulting in a larger proportion of structurally more stable receptors. However it could also reflect the blocking of constitutive internalization and down regulation as suggested for the D164Q mutant  and observed for the wild-type hMOR [27, 38]. Interestingly, CTOP treatment increased Ala348,353 hMOR expression level to a lesser extent than either naloxone or cyprodime. Also the mutant receptor expression level following CTOP treatment was not significantly higher than the one observed for the wild-type receptor. This is in contrast with the larger number of Ala348,353 hMOR receptors detected following treatment with the membrane permeable alkaloids naloxone and cyprodime compared to wild type. These results suggest that stabilization, by alkaloids, of a receptor folding intermediate during its transport to the plasma membrane may also contribute to the upregulation of expression observed for the double mutant. Indeed such a chaperone activity resulting in an increased cell surface expression of rat mu opioid receptor mutants was recently reported . Moreover proper folding of the polypeptide has been demonstrated to be of crucial importance for cell surface expression in several cases  including the human delta opioid receptor expressed in HEK 293 cells . Mutations of the C-terminal cysteine residues have already been reported for several GPCRs [35, 42–44]. At present the influence of C-terminal cysteine mutations on the signaling efficiency seems receptor type-dependent [35, 42–44]. Mutation of the conserved cysteine residues 328/329 into serines in the 5-HT(4a) receptor, a receptor coupled to Gsα, led to a CAM . Using a random mutagenesis screen a delta opioid receptor mutant in which cysteine 328 was replaced by an arginine residue was recently identified as having constitutive activity . Ala348,353 hMOR is the third example of a receptor mutant whose constitutive activity is intertwined with C-terminal cysteine replacement. The two cysteine residues mutated in hMOR are located in well conserved positions (cysteine 353 is conserved in the 5-HT4a receptor and cysteine 348 is equivalent to cysteine 328 in the delta opioid receptor) suggesting a common role at least in some GPCRs. The mechanism underlying the appearance of constitutive activity has been correlated with the palmitoylation state of the cysteine residues in the case of the 5-HT(4a) receptor  and preliminary data indicate that hMOR is palmitoylated when expressed in baculovirus-infected Sf9 cells (Massotte D., unpublished results). However other explanations can be envisaged that would involve the dynamic regulation of the receptor such as a mutation-induced modulation of its phosphorylation state . We are currently further investigating the cysteine residue(s) responsible for Ala348,353 hMOR constitutive activity as well as the underlying mechanisms. We have established that the mutation of cysteines 348 and 353 into alanines resulted in a mutant hMOR receptor whose conformation satisfies criteria known to define a CAM. This is also the first mutant of this type described for the mu opioid receptor that does not require the addition of a ligand to the culture medium to be stably expressed at a pmol/mg membrane protein level. These combined properties suggest that this mutant receptor is of potential use for inverse agonist screening. This is indeed the case since Ala348,353 hMOR high basal activity led for the first time to the identification of CTOP and cyprodime as inverse agonists and will undoubtedly trigger the discovery of others. Identification of such ligands offers new tools to probe the spontaneous activity of the wild-type mu opioid receptor upon chronic administration of drugs. This CAM also provides an interesting model that mimics spontaneous receptor activity and could help to address the mechanisms underlying the development of drug tolerance and dependence. [3H] Diprenorphine was purchased from Amersham (Arlington Heights, IL, USA) and [35S] GTPγS (specific activity 1250 Ci/mmol) from Perkin Elmer Life Science (Boston, Ma, USA). Ligands were from Sigma (St Louis, MO, USA). All materials for tissue culture were supplied by Life Technologies, Inc. (Paisley, U.K). The cDNA encoding the human mu opioid receptor in pcDNA3 was used as a template to generate a mutant in which C348A and C353A mutations were introduced using PCR. The oligonucleotide A containing a Kpn I site (underlined) 5'-ATTGGGGTACC CCATG GACAGCAGCGCTGCC-3' and the oligonucleotide 5'-GAACTCTCTGAAGGC TCGTTTGAA-3' were used to generate the C348A mutation. The oligonucleotide 5'-TTCAGAGAGTTCGCT ATCCCAA-3' and the oligonucleotide B containing a Kpn I site (underlined) 5'-CTCGGGTACC TTA GGGCAACGGAGCAGTTTCTGC-3' were used to generate the C353A. The resulting PCR products were used as templates for a second amplification by PCR using oligonucleotides A and B to generate the double mutant Ala348,353 hMOR that was introduced in the Kpn I site of pcDNA3 and verified by sequencing. HEK 293 cells were maintained in MEM containing 10% (v/v) fetal calf serum and 2 mM glutamine. Cells plated in 10 cm2 dishes at semi-confluence were transfected with hMOR, or Ala348,353 hMOR using calcium phosphate co-precipitation. Individual clones were isolated and expanded in the presence of 100 μg/mL geneticin. Where indicated, cells were treated with 100 ng/ml PTX for 20 h before harvesting. HEK 293 cells stably expressing hMOR or Ala348,353 hMOR were treated with 1 μM naloxone, cyprodime or CTOP for 48 h with one medium exchange after 24 h. Cells were then washed three times with PBS containing 320 mM sucrose, resuspended in 50 mM Tris, pH 7.4 containing 320 mM sucrose and counted. Saturation analysis was performed on intact cells under conditions similar to those described for membranes (see below). 0.2% BSA was added to all buffers when CTOP-treated cells were used. Cells were collected, washed twice with PBS and stored at -80°C in PBS containing 320 mM sucrose. Cell pellets were resuspended in ice cold 50 mM Tris-HCl, 1 mM EDTA, pH 7.4, disrupted using a glass homogenizer and centrifuged at 2000 g for 10 min. The pellet was homogenized in ice cold 50 mM Tris-HCl, 1 mM EDTA, pH 7.4 and centrifuged at 1000 g for 5 min. Both supernatants were combined and ultracentrifuged at 100 000 g for 40 min at 4°C. The pellet was resuspended in 50 mM Tris-HCl, 1 mM EDTA, 320 mM sucrose, pH 7.4 then homogenized through a 26-gauge needle and stored in aliquots at -80°C before use. For each assay 10 μg of membrane protein was incubated in 50 mM Tris-HCl, pH 7.4 with the appropriate ligands in a final volume of 500 μl for 30 min at 22°C. For all saturation experiments [3H] diprenorphine was used in a 0.05–6.4 nM range and naloxone was used at 2 μM to determine non-specific binding. For all competition experiments [3H] diprenorphine was used at 1 nM and the competing ligand in a 10-5–10-13 M range. In both cases, incubation was terminated by rapid filtration on GF/B filters treated with 0.1% (vol/vol) polyethylenimine followed by three washes with ice-cold 50 mM Tris-HCl, pH 7.4 on a Brandell cell harvester. Bound radioactivity was determined by scintillation counting. Scatchard and competition analyses were performed using the EBDA/Ligand program (G.A. McPherson, Biosoft, Cambridge, UK). Stock [35S] GTPγS was diluted to 50 nM in 10 mM tricine pH 7.4, 10 mM DTT. Aliquots were stored at -80°C. For each assay, 10 μg of membrane protein was incubated in 50 mM Hepes, pH 7.4, 5 mM MgCl2, 100 mM NaCl, 1 mM EDTA, 1 mM DTT, 0.1% (wt/vol) BSA, 10 μM GDP, 0.1 nM [35S] GTPγS and the appropriate ligand, in a final volume of 200 μl for 2 h at 4°C. Non specific binding was determined in the presence of 10 μM GTPγS and basal binding was assessed in the absence of agonist. Incubation was terminated by rapid filtration on H2O presoaked GF/B filters followed by three washes with cold 50 mM Tris-HCl pH 7.4, 5 mM MgCl2, 50 mM NaCl using a Brandell cell harvester. Bound radioactivity was determined by scintillation counting. EC50 values were determined using Prism software (GraphPad, San Diego, CA, USA). We would like to thank Dr F. Pattus for financial support, Dr K. Befort for fruitful discussions and L. Snook for critical reading of the manuscript. DM conceived the study and participated in the experimental part.